I live on the Gulf Coast of Mississippi, and have been an active SCUBA diver for over 30 years. I moved here 11 years ago, where I became the photo editor of a local lifestyle magazine. 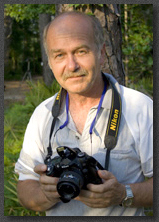 My images have appeared in ISLANDS, SPORT DIVER, South Mississippi Living and National Geographic magazines. A life-long love of the ocean compelled me to pursue a degree in marine biology after leaving the army. I am a web designer, photographer, and computer consultant. Though web design and computer consulting occupy most of my time, my true passion is photography. Currently I have authored 10 Nature calendars, 5 of which feature marine life. I've also written a dozen articles, taken 17 cover shots, as well as photographing over 500 magazine assignments. My work has appeared in photo guides, text books and advertising campaigns. Come visit the Gulf Coast in this stunning 80-page pictorial essay. After Katrina, the Gulf Coast has built itself into a showcase of "The New South." From elegant casinos to miles of white sand beaches, from bayous to Civil War forts, see what the Gulf Coast has to offer. IPAD epub for only $3.99! My other site, Life In The Seas, features many of the marine life images in the calendars pictured above, as well as a complete guide to digital photography. All images and content copyrighted © George Perina, and may not be used without permission. Contact George Perina.